Google’s “street view” has moved into wild Florida. First came “ocean view,” next up: “spring view” – with manatees. CRYSTAL RIVER: On a serene recent morning at Three Sisters Springs, a half-dozen motionless manatees seemed to sleep in as the late-rising sun cast an orange glow on the fog. Barely visible through the trees, manatees rest motionlessly in the closed spring at dawn. “We have a beautiful gift here,” said Tom Gotterup, vice president of the Friends of Crystal River, as he stood in his neon-yellow vest on the boardwalk surrounding the calm, gin-clear spring. The glassy water and the quiet were interrupted only by the occasional loud and startling exhale of a manatee, lifting large nostrils barely above water to take a long breath. Meanwhile at the end of the spring run, the first pontoon boat of the day cautiously pulled up and unloaded excited tourists floating on pool noodles in every color of the rainbow. This was only the beginning. As the sun rose, so did the number of boats and noodle-riding visitors flocking to see the manatees. In 2014 alone, Crystal River National Wildlife Refuge attracted 319,625 visitors, about three times the total population of Citrus County. According to the U.S. Fish and Wildlife Service, 83% of these visitors plunged into the water, making it the most visited in-water refuge in the country. The Fish and Wildlife Service also found that the number of visitors to the Crystal River refuge has tripled between 2009 and 2014. Gotterup said such crowds are becoming difficult to handle for the park and its staff. “Everybody is inundated and overwhelmed,” he said. Excited visitors float on pool noodles at the edge of the sanctuary, eager to catch a glimpse of the manatees on the other side of the rope. Technology may provide part of the answer. Beginning in April, people worldwide will have instant access to the famed destination via a 360-degree underwater virtual tour, accessible through Google’s street view interface. 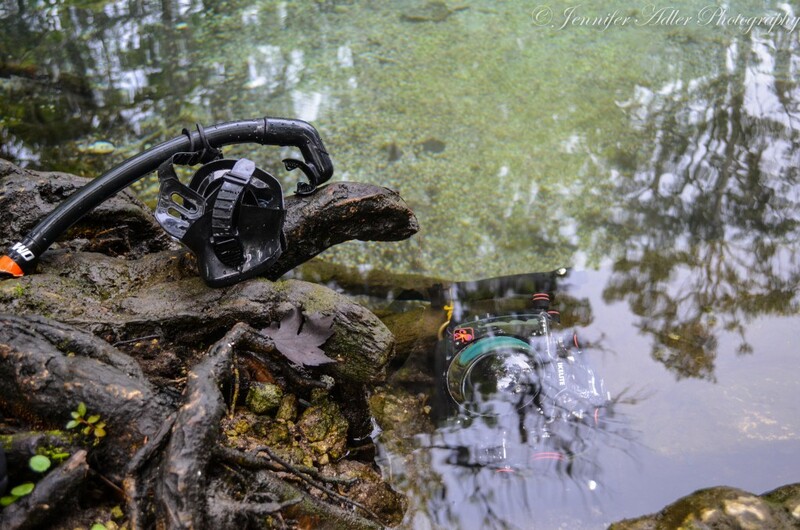 David Ulloa, president of Trident Global Imaging, shoots photos for the virtual tour at Three Sisters Springs. For more photos and a behind-the-scenes view of the shoot, check out the slideshow at the bottom of the page. 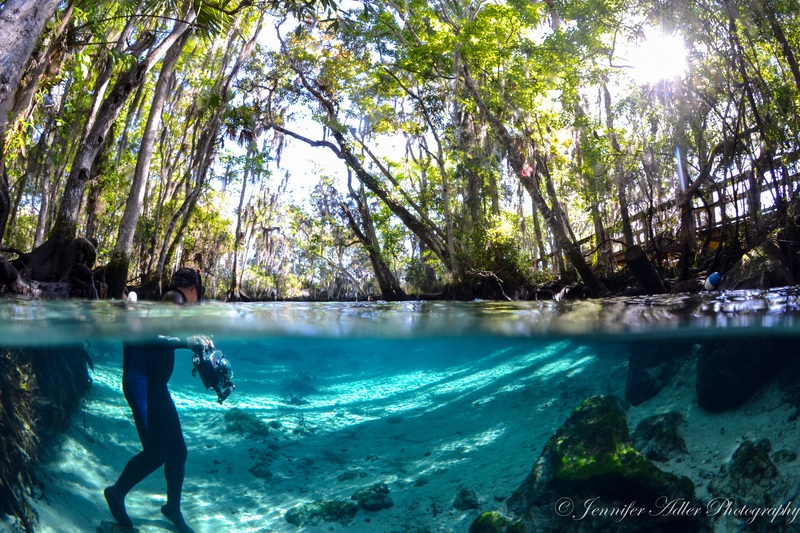 Sponsored by the local group Friends of Crystal River and produced by Trident Global Imaging, the tour will consist of 25 individual, 360-degree images, called “photo spheres,” woven into an underwater immersive experience. Instead of dropping down to a street view at the Crystal River City Hall with its life-sized manatee statue at the entrance, users will be able to explore underwater with the manatees in Three Sisters Springs. They’ll even be able to use their mouse to navigate areas usually off-limits to swimmers. The tour will serve as more than just a fun new portal into the springs. Education is the main goal. Gotterup, as well as Friends of Crystal River president Ross Knudsen and secretary Shirley Knudsen, all hope that the tour will bring the underwater world to more people. Gotterup said the idea is to “help people appreciate these beautiful creatures” and also demonstrate how to properly interact with the manatees. A U.S. Fish and Wildlife biologist joined the film crew in the water to model the best way to interact with the manatees, such as keeping a distance of six to ten feet. 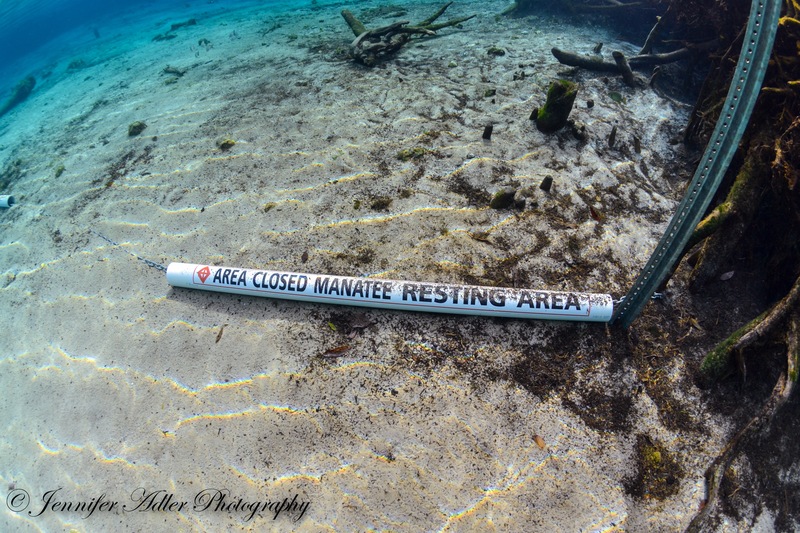 Online users will be able to navigate areas of the spring that are often off-limits to swimmers due to their status as manatee sanctuaries. While he said some people argue the virtual tour has the potential to help with visitor overcrowding, he disagrees and believes that it will most likely attract even more people to swim with the manatees. He said it will also give people who have already visited a chance to compare and contrast the virtual tour with their own experience, which is often characterized by cloudy, crowded conditions on busy days. 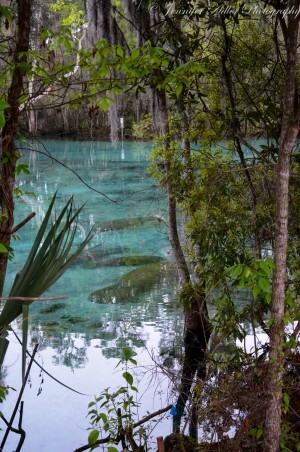 Vicente thinks the virtual tour will tie in well with initiatives to educate people about springs ecosystems, ecology, manatee populations and topics such as freshwater quality and quantity. He hopes the tour will help generate support and advocacy after people see what it’s really like underwater and “witness the magic” themselves. Visit the Friends of Crystal River National Wildlife Refuge Complex Inc. and the USFWS’s Crystal River National Wildlife Refuge websites at the end of April 2015 to view the virtual tour. 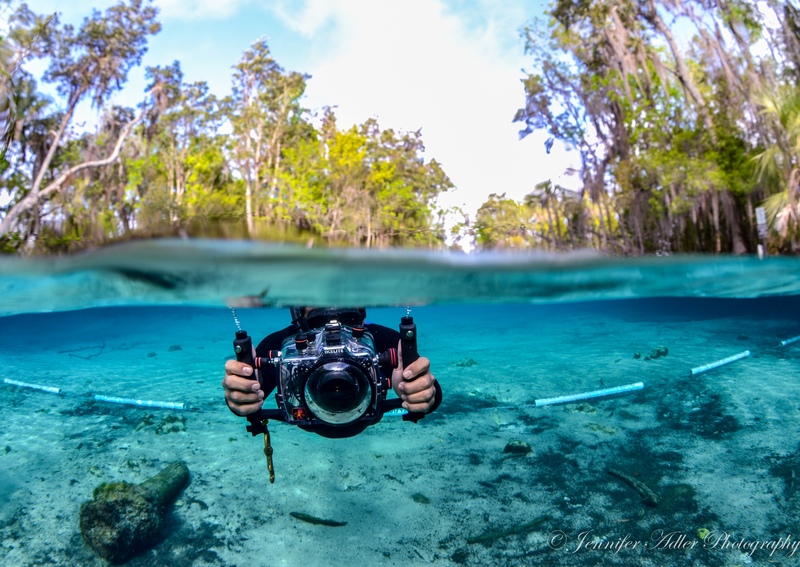 In the meantime, dive in to some of Trident Global Imaging’s other underwater tours in Florida springs such as Silver Glen Springs and Rainbow Springs. Screenshot of the “Google Views” interface. This is Ulloa’s photo sphere of the Natural Well at Silver Glen Springs. 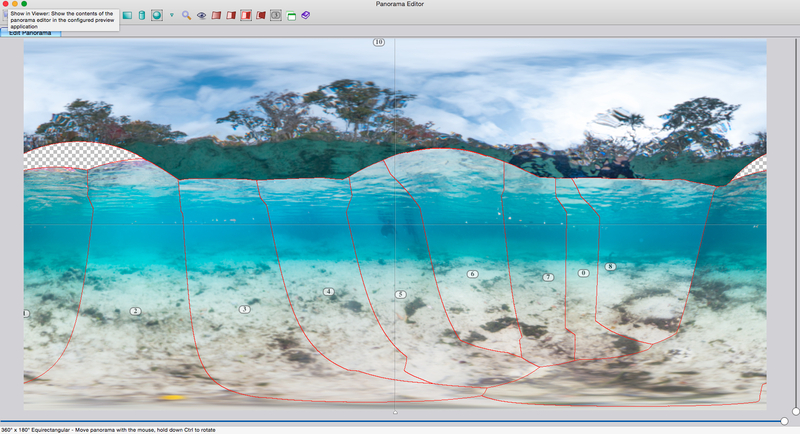 Users can navigate the underwater world and virtually swim with over 500 striped bass and a cave diver. 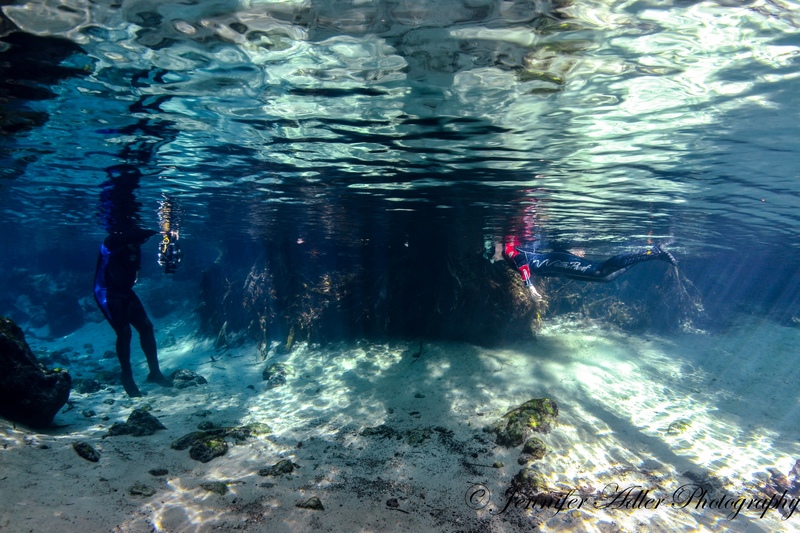 Shooting for the tour is currently under way, and I recently joined Trident Global Imaging’s David Ulloa and Dee McHenry for the second day of in-water action at Three Sisters Springs. 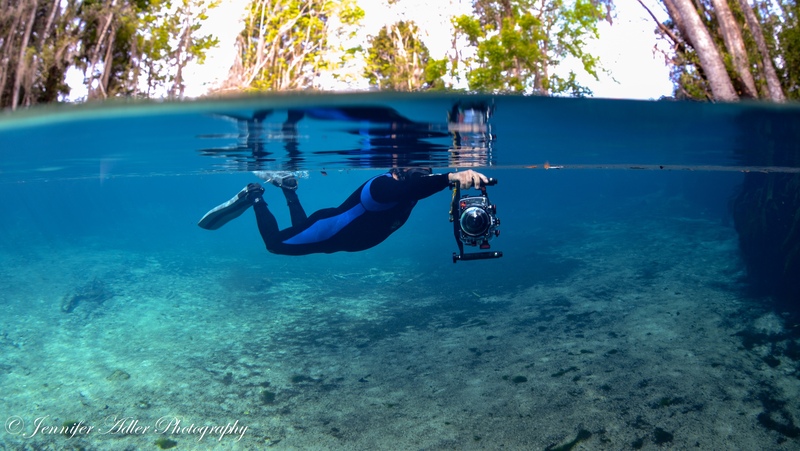 Check out this slideshow for a behind-the-scenes sneak peek of a day in the water with the Trident Global Imaging team as they shoot photos for the underwater virtual tour at Three Sisters Springs. Essential tools: An SLR camera in an underwater housing (this one is equipped with a 10mm fisheye lens) and a mask and snorkel. 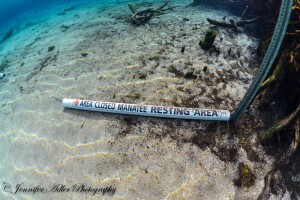 Ulloa stationed his mask, snorkel and camera by the water and waited for the clouds to clear in the morning. He needed full sunlight to take the best photos. Once the sun came out, he carefully entered the water to document the last manatees of the morning as they woke up and left the spring. The tour will be made up of 25 individual photo spheres, which essentially means 25 places in the spring where online users can navigate to and pan 360 degrees. For each sphere, Ulloa identifies a “node” (central point for a sphere) and takes between 10 and 30 photos while pivoting in a circle, being careful to keep the camera over the central node. Next, he takes one photo with the camera pointing directly up toward the sky and one looking directly down at the ground. The wide-angle fisheye lens and multiple photographs allow him to cover the 360 degree view. Ulloa photographs a U.S. Fish and Wildlife Service biologist as she models the appropriate way to interact with a manatee. Unfortunately, the warm temperatures meant that the few manatees we saw in the spring early in the morning left before the sun was sufficient for taking photos. Here, Ulloa photographs his co-founder Dee McHenry. Before jumping in the water, McHenry was on the boardwalk marking the location of the photospheres on her iPad to make sure they documented the entire spring. Back in the office, Ulloa manipulates and “stitches” the photos together using a variety of software programs – sometimes 8-10 different programs. The photos go through many stages of processing. 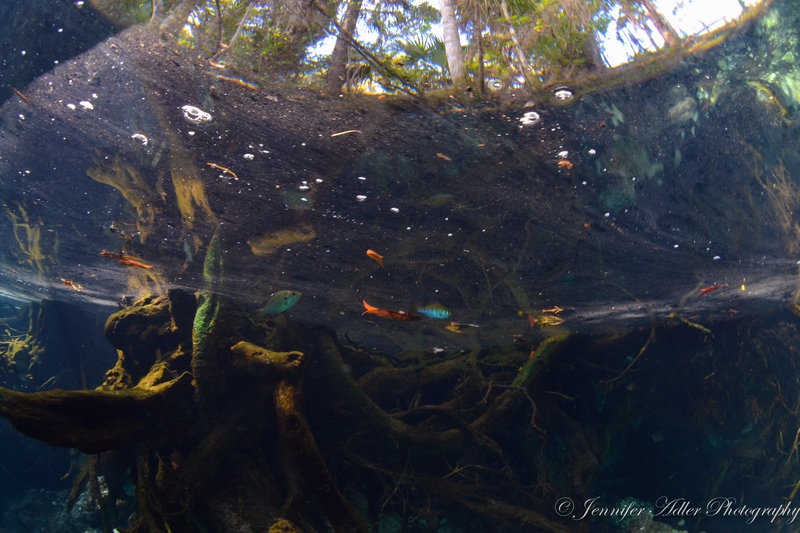 It’s an incredibly time consuming process, especially using underwater images in which fish, manatees, and other elements (including the photographer!) are moving. A shoot like this one at Crystal River requires 2-3 days in the field and another 20-30 to edit and stitch. This shoot yielded about 2500 images to sort, edit, and blend together. At the end of the 4.5 hour closure of the spring, antsy swimmers on noodles, canoes, and kayaks jockeyed for positions, hoping, but not lucky enough to find a manatee. 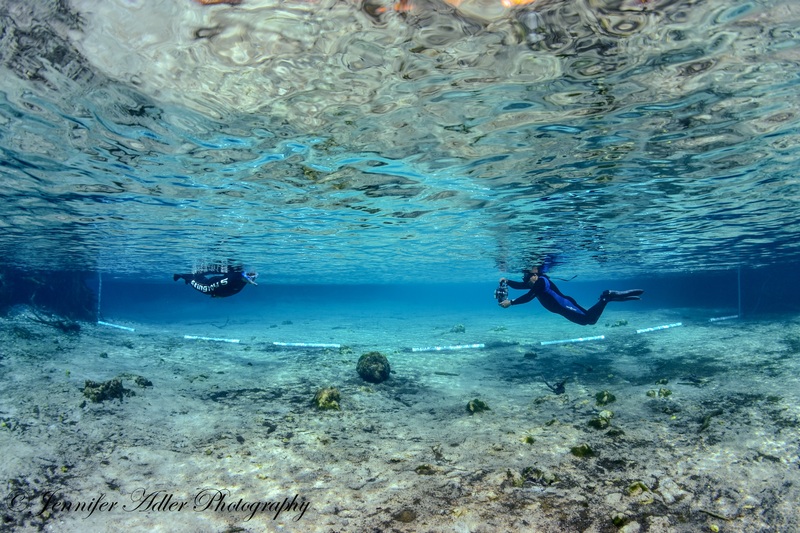 With a snorkel and mask, they would be delighted to find reflective and peaceful views just beneath the surface. Even without, they’ll have the opportunity to see the virtual tour in April.